The most important question to start with is what is a MANDALA? To begin with, the word "mandala" comes from the Indian language, Sanskrit, meaning "circle". This primordial shape symbolizes many qualities such as unity, wholeness, perfection and divinity and has been prevalent in most cultures around the world. The center of the mandala represents our spirit or awareness. Deeply metaphysical, the creation of each mandala is extremely meaningful. Masters who produce mandalas follow a tradition passed on from generation to generation. So much so with each stroke, color and shape the completed mandala is not only a work of art but truly a part of the artist. In many ways the most important part of a mandala is not in the finished form, but in its creation. That isn't to say that once created, the mandala loses its value. The completed mandala truly is a living item that has a healing power. One only has to take a personal journey following the depths and colors of the mandala. Its special message is said to speak, bringing clarity, serenity, and peace to a busy mind. Red is an energy color for life and healing evoking fire and deep burning emotions. It speaks of action. Orange colors show the most warmth, intensity and fire. A prideful color, it adds self awareness. Yellow almost obviously is the color of light, warmth and the sun. As such, it is a source of light. Green color in countless shades are part of nature and represent health, growth and renewal. Green also relates to the heart chakra along with pink. Blue expresses unfailing love, serenity and relaxation. It is a calming color full of compassion and depth. Turquoise blue represents truth, articulation and communication relating to the throat chakra. With purple we have a color of life, vivid in intensity, it represents royalty and authority as well as intuition. White while not technically a color, is a symbol of light, innocence and purity. It adds clarity to the spiritual experience, and represents divinity. Of course color is only one facet of the mandala. The shapes inside of a mandala also contain meaning. Some of the most popular shapes are circles, spirals, triangles and squares. Flowers as a whole represent our consciousness; however, each type of flower is symbolic of qualities such as wisdom, purity, kindness, perseverance, love, friendship, etc. Spirals convey growth and learning. They bring a different perspective and represent change. The triangle is uniquely associated with dreams, goals and vision. The square is stable and solid, showing security and a foundation of ideas. The square represents the building process. This brief understanding of the mandala is by no means complete. The true meaning of each mandala is specific to the individual. So I welcome you as you begin your personal journey of enlightenment in the world of the mandala. 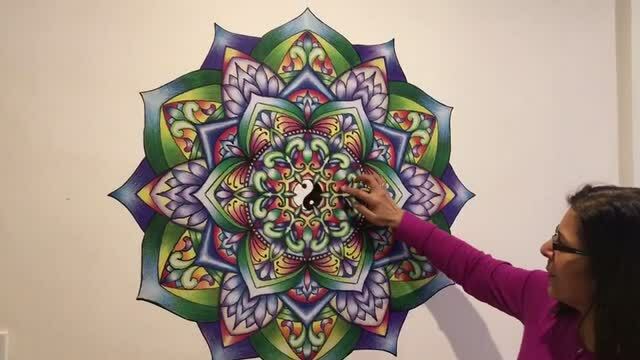 Inspire Me Mandalas is based near Seattle, Washington, offering unique, handmade original mandala art in a growing number of media.